Most organizational change questions have the same form: “How can we change other people?” But we acquire better, happier organizations by changing ourselves instead of others. When people don’t focus on improving themselves, is it any wonder they’re always complaining about each other? For many organizations, a common practice is that they are managed like machines. We call this Management 1.0. In this style of management, leaders assume that improvement of the whole requires monitoring, repairing, and replacing the parts. It was engineers who developed scientific management, the command-and-control style of leadership that was quite successful in the 20th century. 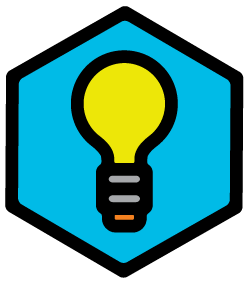 Engineers developed most management frameworks with upfront design, top-down planning and command-and-control structures and processes. Fortunately, many managers have realized that the greater challenge is working with people, not with machines. In a Management 2.0 organization, everyone recognizes that “people are the most valuable assets” and that managers have to become “servant leaders”. But, at the same time, managers prefer to stick to the hierarchy. Types of Management. 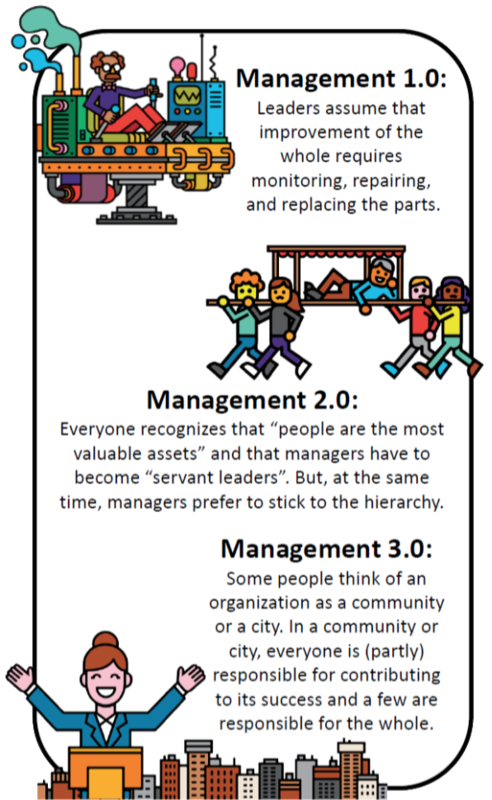 Learn more about Management 3.0 Principles below. Some people think of an organization as a community or a city. You can do what you want, as long as you allow the community to benefit from your work. We call that Management 3.0. In a community or city, everyone is (partly) responsible for contributing to its success and a few are responsible for the whole. We all know bad management (1.0), but there are also plenty of examples of good intentions with bad results (2.0). Usually, people don’t have many specific examples of 3.0 practices, which is why we offer Management 3.0 workshops around the globe! Principles don’t change that much over time but practices will. They depend on the context and therefore will evolve over time. Some practices will be successful in some environments and some won’t. Get people involved in the work, get people involved in interacting with each other. Increase interactions between people. A Management 3.0 practice should improve the system. The system is not just one team, everyone interacting with the team is part of the system. We believe in a win-win. We should try to improve the whole system and not just one part of the system. Clients are not just our external customers, we consider everyone involved in the system a client. Co-workers, other teams, customers, shareholders, etc… We should try to delight all clients, not just the stakeholders or just our co-workers. We believe that it is hard to change behavior of people. However, when you change their environment, people will have to adapt and change their behavior to fit into the new environment. Also by changing the environment people can manage themselves. Management is just about nurturing the garden. Co-workers create things together, and co-creating is also about giving feedback to each other. Co-create behavior. Principles rarely change, but practices always depend on the context.